Welcome to the Godly Christian Music... Here you can find over 3000 free mp3 songs to download by our gifted musicians. Godly Christian Music has recently been redesigned with a more artistic edge. In addition, it continues to grow as new musicians keep posting more free Christian Songs. Want to become a Godly Christian Music Artist? Godly Christian Music has come a long way over the last couple years. Originally, this free music site was simply a couple static pages created with Microsoft® Word® for people to download a few artists' songs. Back in late 2006 the site administrator started to learn a new programing language with the hopes of being able to use it to turn Godly Christian Music into a dynamic data base driven site. There were many obstacles to overcome in this process of updating this free song download website. One major difficulty was simply getting the time to learn the new programing language. The Godly Christian Music administrator frequently had to stop the process of learning again and again on account of several life trials. Nevertheless, through perseverance and the mercy of the Lord, the new language was learned after about a year and so more free songs were soon to follow. The Godly Christian Music site administrator spent several weeks planing before much of the coding actually began. A great deal of thought went into what the site should be able to do and what would be the priorities for implementation. The first thing that was tackled were the Godly Christian Music Administrative pages. This required implementing a login system that would accommodate both artists and administrators. During this stage most of the internal structure of the free Christian music site was established. The primary functionality of these pages allowed artist to begin managing their own songs and modifying the descriptions and search features of their free music. Once the functionality of the administrative pages was working properly and all the artists' free songs got entered into the database, the process began of making Godly Christian Music's new features available to its users. At first the database was simply integrated into the simple temporary design so that stats could begin to be generated for the songs and artists while a new formal design for the front side could be completed. This new design would change the whole functionality of this free Christian music download site, granting users the ability to search our songs by genre, theme, instrument, and title. The new design for the front side of the music site was a great challenge and required help from above. After several failed attempts, finally a break through occurred when the designer came to find beauty in simplicity. 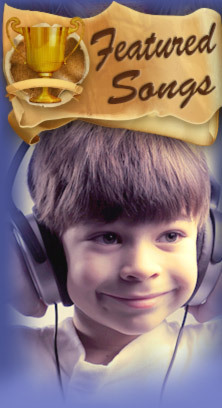 Once the template was made, several weeks followed creating the images that would mark the face of Godly Christian Music. Once the design work was complete, all the programing commenced. Each free music page had to be intricately tied to the database system and systematically worked into the whole of the Godly Christian Music website. When this process was completed the initial bare bones functionality was made available to the free Christian music listeners. Work didn't end there though, once the initial front side of the site was up, all the other little features needed to be programed in and activated for people to use when searching our free music. Some of these other features included: the ability for the artists to post chords and lyrics with their free songs, an opportunity for listeners to post testimonies about how they have been blessed by Godly Christian Music, and the option for artist to post events where they might be leading worship. These was the answer to many who have cried, "HELP ME FIND A GOOD CHRISTIAN SONG!" or "HELP ME SHARE MY CHRISTIAN SONGS!" The last major update was posted on October 21, 2008 marking one complete year from the day the temporary design of the site was posted, to the day that the formal completed design of Godly Christian Music was working. Now, ongoing labor continues and minor changes are made to the site to better accommodate the users' experience. In addition, the site administrator has begun recording new artists and finding more free songs to encourage the site's listeners. Correspondence has also been increasing as talented artists find the site and ask to post their free songs here. Therefore, work on Godly Christian Music likely won't end for quite some time to come. Keep coming back and checking things out each month as the site grows. Please pray for the artists, the administrator, and the Godly Christian Music website so that we may be able to continue bringing you your favorite Christian song downloads for free! The idea for making this website started in late 2003 when a brother named Scott Emery in Grand Rapids Michigan wanted to share some music that the Lord had given him. Having learned to play the guitar earlier in life he began focusing his efforts toward blessing the body of Christ by writing many songs that were directly from the bible. During that year, he had also encountered others the Lord blessed musically. The music that these saints had put together was floating around on various tapes and CDs, but as a whole, these songs were only available to a small, scattered group of people throughout the United States. Some of the godly christians Scott had met during this time were Alan Martin, the Fournier Family, and Doug Tanner. Alan Martin was living in Missouri at the time and had recoded several inspirational songs many years ago. The music was put on a cassette tape and only a very small number of people ever knew it existed. In early 2005, this tape was digitally re-mastered and made public through this website. Since that time, Alan Martin has also recorded a few other christian christian songs that are presently on this site as well. Download them NOW for Free! About a year after meeting Alan Martin, Scott Emery and the other believers in Grand Rapids were introduced to the Fournier Family. They to were also living in Missouri at the time and have over 10 children. Through the years, they have written several songs that they would sing as a family. In 2004, they recorded their music and sent it to several families in Grand Rapids. You can now find the contents of that CD here. Click here to listen to the CD Free of charge! Around 2003, Scott went to Ohio with a couple other brothers from Grand Rapids to hear a christian man speak about what a New Testament church looks like. While there, Scott was asked to share a couple songs with everyone. Afterwards, he met a guy from Colorado named Doug Tanner who gave him a CD with several songs Tanner had recorded. Doug Tanner had previously recorded a number of songs, but at that point, they were not widely distributed. Scott maintained contact with Doug Tanner over the following year and later when Doug had recorded a second CD, he sent it to Scott. In the summer of 2004 the saints in Ohio, whom Scott had visited in 2003, combined Doug’s two CDs and distributed the compilation CD during one of their conferences. Those CDs ran out quickly, but now you can download free most of Doug Tanner’s music anytime you would like. Slimply Click here to find his free Music! Over time, we here in Grand Rapids had met various other Jesus loving/obeying Christian worshipers like the Smith Family, a Church in Indianapolis, and Barak Bendixen (a.k.a. Brother Bear). In spring of 2004, we here in Grand Rapids had a visitor from Kenya. After he shared about what the Lord was doing in Kenya, two brothers from Grand Rapids drove him down to southern Michigan so that he could testify there. The next place he would testify would be the Smith Family’s Church and so they all stayed with the Smith Family that night. While they were there, the Children of the Smith Family sang several four-part harmony songs in a cappella. Having been very blessed by the family, contact continued over the following months. Later, one of the brothers who had originally traveled with the man from Kenya spent a week with the Smiths recording their songs and editing some of the songs that had previously been recorded. Now you can find the product of these christians combined efforts here on this website and download them free. Download the Smith's Christian A cappella Music Now! Right around the time the man can from Kenya, we here in Grand Rapids met the Young family. The Young’s had been reading a lot of material from a church in Indianapolis and had been very excited by their vision of the Church. Over the following months, several saints here in Grand Rapids had received a number of books and various other materials from Indianapolis as well. Among the many helpful and insightful materials, that the Church in Indianapolis sent to us was a worship CD titled “If you believe.” This album is a compiled work of many saints in Indianapolis that stirs deep thought of our walk with Jesus. You can now find this collection on the GodlyChristianMusic website. We received permission from Indianapolis to offer you the free downloads of their worship. Click Now and hear these Christians Sing! During the fall of 2004, several christian believers in Grand Rapids went to Flint Michigan to spend some time with a family there named the Ryans. The Ryans invited several people over one night to spend time in prayer and to serve each other. One of the people who came that night was Barak Bendixen. Barak had written several songs and he shared several of them that night. Toward the end of time together, he gave us here in Grand Rapids a CD of his music. Some of his Songs can be downloaded here. Get his songs Free right Now! If you are saying, "help me find tons of free Christian music to download!" ...you're in the right place. Here you will find over 2000 songs to listen to in MP3 format. This site features godly music with all kinds of styles and genres. It has everything from A cappella to fancy instrumentals with vocals. All these great Christian songs were produced by people who have a testimony of deliverance from darkness and into fellowship with the Son of God, Jesus Christ. You will find that much of the great free Christian music on this site is in the form of Scripture songs (i.e. they come straight out of the Bible). Also tons of our music has song lyrics for Christian songs. Our main desire with this site is to give away the great godly Christian music for free that Lord has given us. In addition, to do it in such a way that it is available for people all around the world. Therefore, we have taken the time to make it possible to download or listen to all these wonderful Christian Christian songs from the internet. We hope that this website that is full of free godly songs, blesses and encourages you to stay focused on Christ at all times.